It is obvious that all drivers including truck drivers are subject to the same rules of the road and Connecticut DMV laws. The distinction is that a truck driver is driving for a living, logging a lot more hours behind the wheel, has a tremendously greater amount of exposure time to law enforcement on the highway and also has a Commercial Driver’s License (CDL) and as such can’t receive as many tickets as a normal motorist. If you are a truck driver and hold a CDL every moving violation is a threat to your livelihood and ability to earn a living and you should handle each one seriously by contacting a Stamford trucking violations defense attorney to protect your rights and find every possible way to have that ticket dismissed or reduced. See our Traffic Ticket Defense page for details on how we handle the defense of traffic tickets and infractions. We are located one block from the Stamford Court House which is a few miles from the State line and one of the most heavily traveled weigh station / truck inspection centers in the State. The weigh station is located on I-95 north bound in Greenwich, Connecticut between exits 2 and 3. The State asserts that overweight trucks present a safety hazard to motorists as they do not respond as quickly and present and increased risk of accidents. Also, the State claims that overweight trucks destroy State roads and bridges. While there may be some truth to these claims, in my opinion there can be no doubt that the State has turned the weight station into a revenue generation stream for the state as the fines and penalties associated with overweight trucks can often reach well over $1,000 or significantly more. We have seen fines go over $10,000. If you have received an overweight truck violation then you should contact a Stamford overweight truck violations defense lawyer with 25 years of experience in handling trucking violations and CDL license defense at the Law Offices of Allan F. Friedman. Contact us today for a free initial consultation. The statistics demonstrate that the issuance of tickets for weight station stops is increasing each year. The State is using this huge source of revenue as a cash cow to help bail out the budget deficit. 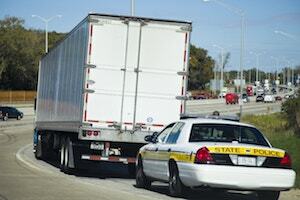 Many trucking companies consider these hefty fines a part of the cost of doing business. However, at The Law Offices of Allan F. Friedman, we have a proven track record of having overweight truck and equipment violation fines either reduced significantly or thrown out altogether. The very sad reality is that many trucking companies simply mail in a check and pay the ticket. This is a huge source of revenue for the State and is what motivates these weight stations and road side stings. It should be noted that often a truck weigh station inspection can lead to other violations such as equipment violations, warrants, drug possession and operation under the influence. When giving you a CDL truck moving violation or equipment violation the very next thing the Police officer will tell you is that you can just mail in the ticket and pay the fine or do so on line – don’t do that – always plead not guilty and request a Court date. If you plead guilty to any CDL violation, although the ticket on the back says that they will not assess points if you plead guilty by mail or on line, that information is not accurate. Each CDL offense that you plead guilty to will become a part of your permanent driving history record. Your insurance company re-examines your driving history each year and your rates can increase significantly as you start to pick up moving violations. Also, future employers can and will often check your driving record before hiring you. With a CDL you can lose your right to drive very quickly as you pick up tickets. The best approach is to try to have all moving violations either dismissed outright or reduced to non-moving violations which carry no points. Retain an experienced Stamford CDL license defense and trucking violations attorney to try and have your ticket dismissed. How Does This Work, How Can an Attorney Help? When you get a ticket it is often not readily apparent just how serious the charge is or what kind of charge it is. This is why you should always speak to a commercial driver’s license defense and trucking violations attorney to discuss your options. I have had a lot of success in negotiating the significant reduction in the amounts of overweight violation tickets and equipment violation tickets which are the responsibility of the truck owner (not the driver). In some cases, there may be legitimate grounds to contest the constitutionality of the traffic stop in the first instance leading to a dismissal of the entire ticket. That is why BEFORE you plead guilty to any ticket or trucking violation summons or overweight tuck ticket that you have a consultation with an attorney at the Law Offices of Allan F. Friedman to review the charges and consequences of a guilty plea. Your initial consultation is always free. We are straight shooters. We respect truck drivers and all the long hard hours that you put in behind the wheel. We understand that truckers are often traveling all over the country. We will work around your schedule. When you schedule your free initial consultation we will review all of the facts of your case. We have experience in working in Courts all over the State of Connecticut. We will discuss the goals of our representation which are usually a dismissal or a reduction of the charges to a non-moving violation which carries no points. In many cases having an experienced Stamford commercial driver’ license defense and trucking violations attorney to defend your case can make the difference in having that matter dismissed or reduced down to a lesser charge. For overweight truck violations we can get the fine amount significantly reduced in almost every case. If you are charged with a more serious vehicle crime like evading responsibility, reckless driving, operation under suspension, DUI/DWI or other misdemeanor offenses which require a mandatory Court appearance you are going to need an CDL defense lawyer to work to resolve the charges while minimizing the consequences. Our legal fees are very reasonable flat fee rates. There are no surprises, we work with written retainer agreements and everything is laid out in black and white. Contact a Connecticut Overweight Truck / CDL Defense and Trucking Violations Defense Attorney Today! If you have received a citation for an overweight truck for any moving violation involving your CDL, or other trucking violation in Greenwich, Stamford, Norwalk, Darien, New Canaan, Cos Cob, Fairfield, Westport, Wilton, Weston, Bridgeport and throughout the County of Fairfield do not hesitate to contact the Law Offices of Allan F. Friedman. We work on a flat fee basis and our rates are very reasonable. Call Attorney Friedman at 203.515.4110 to schedule your free initial consultation we are available 24/7 - 365 days a year. Or you can contact them online for a prompt response.